Choosing and purchasing business insurance in Phoenix AZ can be a difficult task. In fact, with so many different options available, it can be hard to determine the type of coverage your business needs. You may even be surprised to know that most small and medium sized businesses are in a class that insurance carriers refer to as “Low Risk”. If your business falls into this category, then you are likely eligible for a low cost package policy known as a BOP, or Business Owner’s Policy, which includes the main and most important types of commercial general liability insurance as well as property insurance. 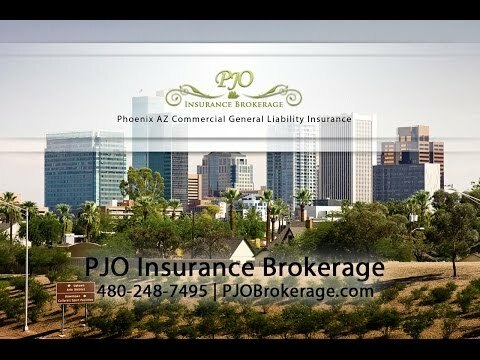 Phoenix commercial general liability insurance coverage may provide protection from bodily injury, property damages, products and completed operations, personal and advertising injury, as well as protection from other risks of liability that are imposed by lawsuits or similar claims. This type of business insurance may protect the insured in the event that your business is sued for claims that come within the scope of coverage of the insurance policy. When a claim is made, the insurance carrier can provide defense against these claims. In the U.S., commercial general liability insurance appears most often in the commercial general liability policy obtained by the businesses, and in homeowner’s insurance policies, by individual homeowners. This is the most basic type of insurance plans small business owners should carry for their own protection. The cost for this varies greatly depending on the type of business and the inherent risks involved in that business. For example a retail store would need this insurance but would be less expensive than a roofing company where there are more potential liabilities involved. But even if your business is not “inherently risky”, and you or your employees are meeting with customers, you will need this insurance. Additionally, most commercial property landlords require that their tenants have general liability insurance when leasing space to them. Your needs for coverage are always unique to YOUR business. We can work with you to help you determine what types of business insurance coverage best suits your business! Commercial General Liability Insurance is required for all organizations. It protects against a variety of risks that companies are subjected to, such as lawsuits for things including slander to medical care insurance to covering the expense of settlement bonds, which might be required in the event of a summary judgment against your business. Commercial General Liability Insurance Coverages are greatly varied in price, depending upon the risk classification assigned by the underwriter. Typically, the premium for the Scottsdale liability insurance coverage will likely be a percentage of profits, since the amount of your operations determines the level of risk one should be covered against. Being properly insured is without a doubt necessary, so let us here at PJO Insurance Brokerage help you to help protect your business! When Is Business Liability Insurance Necessary? Liability insurance for PHX businesses can be confusing for both new business owners and established companies who have been in business a long time. Having coverage for your small or large company can help you prevent costly expenses in the unfortunate event of claims, injuries, or damages. In many events, having the proper insurance not only secures you from significant financial burdens, but it also helps you secure potential clients who feel safer and more comfortable working with properly insured companies. All companies should have this type of Arizona liability coverage, protecting your business or yourself from having to pay for claims out of pocket, as well as protecting your assets from liquidation in the event of failure to have proper insurance. Liability insurance is especially necessary for professions including contractors, wholesale or retail businesses, service businesses, or home-based businesses, regardless of whether or not you engage in prevention and safety techniques to avoid these issues or events; they can still happen, so it’s important to be prepared with quality Phoenix Arizona Business Liability Insurance! Liability business insurance acts as an economic safety net in the event that a client suffers an injury or damages and, subsequently, sues the business. This form of insurance may cover monetary damages and legal fees. There are three primary kinds of business liability insurance—General Liability which may or may not include Product/Completed Operations Liability, and Professional Liability. Before purchasing insurance, one should first understand the differences between the insurance types.